According to reports in the English press, Tottenham right-back Serge Aurier missed the game against Manchester United after being arrested. The Ivory Coast international was reportedly detained by police after assaulting his partner, Hencha Voigt, who he lives with and has a child with. Everything was resolved in a few hours and the Spurs defender was released without charge, but it means he was unable to take part against United. 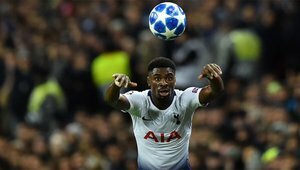 Aurier denied the allegations with a spokesman for Hertfordshire police confirming "a 26-year-old man was arreseted on Saturday night under the suspision of aggression and was released shortly after." Tottenham say they are "aware of an incident relating to Serge Aurier" this weekend. It is not the first time Aurier has received negative press. It's seen him miss out on many opportunities, such as signing for Barcelona. "I won't end up at Barça because of my bad reputation," he once admitted.